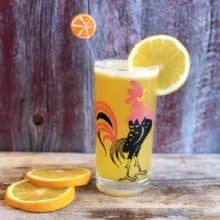 A Harvey Wallbanger is a popular cocktail that was invented in 1952 according to some sources. This drink is a very popular one in bars around the world and is super easy to make. Take the oranges and squeeze them with a juicer into a Boston Shaker or similar cocktail shaker with ice. Add the vodka and Galliano to the shaker as well. Pour into glass, garnish with orange slice and serve. You can also use orange juice if desired.